We were on our way to Almagordo from Albuquerque when I spotted a sign saying that the Very Large Array was at Exit 147. What the sign DIDN’T say was that the National Radio Astronomy Observatory was another 60 miles on some fairly lonely roads. The Very Large Array, one of the world’s premier astronomical radio observatories, consists of 27 radio antennas in a Y-shaped configuration on the Plains of San Agustin fifty miles west of Socorro, New Mexico. 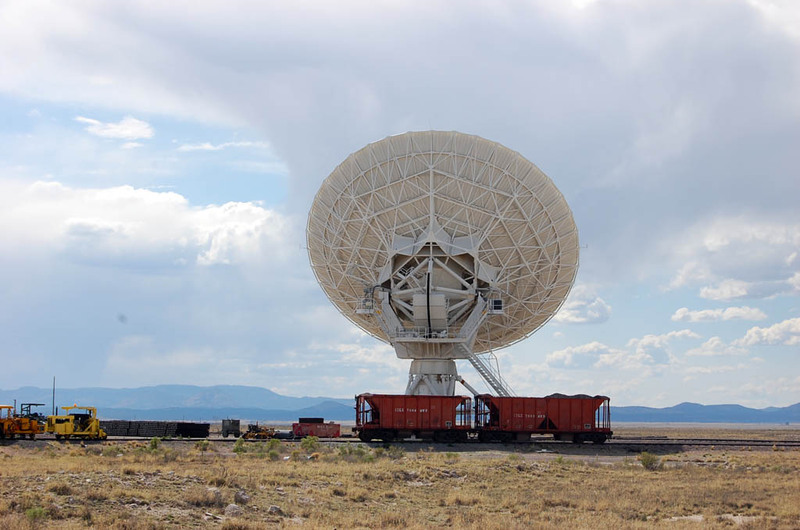 You can get an idea of how large the antennas are by comparing them to the boxcars. Wife Lila is a space enthusiast, so we rated the side trip as well worthwhile, even if nobody came running out of the labs shouting, “Eureaka!” and being whisked away in black helicopters. We’ll have more when we get back home. We went to visit the VLA in 2002 on our trip out west. I’m pretty sure they’re just stealing Cinemax and not researching aliens or tracking inbound cruise missiles. Otherwise, why would they have let us get so close?